Welcome to the fanclub dedicated to our virtual singing chimera, Kasane Teto! A club for fans of Teto to meet, share and discuss anything related to her. Unfortunately, Teto doesn't have much official merchandise yet, but we started to see more and more people being interested in her on the site, so we wanted to create this club to bring fans of her together and try to find and share our goods with each other. 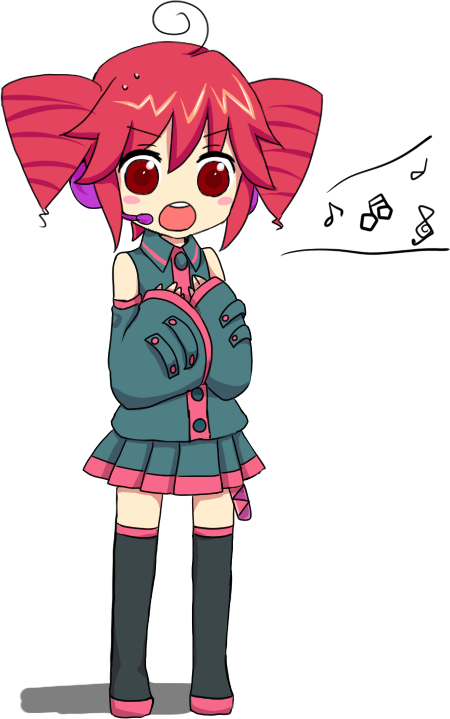 If you have any questions or just want to share anything related to Teto, don't be afraid to drop a comment or start a forum thread! Feel free to join and invite other Teto fans! Kasane Teto (重音テト) is a Japanese UTAU (a software similar to VOCALOID, but completely free) who was originally created as a troll "VOCALOID" by people on 2chan for April Fools' Day in 2008. She was designed by Sen, and her voice is provided by Oyamano Mayo/Yamanon. They are part of the current team that maintains her, TWINDRILL. Although her voicebank is only for use in UTAU, many people still mistake her for a VOCALOID. However, with her being very popular in both the UTAU and VOCALOID community, she got recognized by Crypton Future Media and SEGA and has since appeared in the Project Diva game series and various merchandise, including her own Nendoroid and a plush by Gift. ICantBelieveIts (8 kuukautta sitten) #38313169May I join, please? ^o^Oh, I didn't notice your message until now, sorry! Of course you can, I'll add you right away! I created a thread for song discussing, and also one where I listed off some basic rules so it's easier to see. EDIT: Btw, if you wanna make sure you get notifications from anywhere (the comments, forums etc), make sure to click the "Subscribe" link up in the left corner. I actually have a whole playlist of teto songs so let me see if i can find some of the best ones. Akira (2 vuotta sitten) #17256754Thanks for the invite! I was hesitant to join when I discovered the club but heck, I love Teto! I like many types of songs, though I typically prefer more up-beat types and realistic tuning. Oh wow, that's a hard question, I love way too many Teto songs, but let's sum it up briefly lol. I love nakano4, in fact they may be my favorite producer ever! I'm pretty sure my favorite Teto original ever is Sky High by nakano4, I just love the simplicity and originality of it, the lyrics, and Teto sounds like an angel (*ฅ́˘ฅ̀*) Contrast is probably my 2nd fave song by them! VocalVortex (2 vuotta sitten) #17262252Seriously, I need to make a list somewhere online so I can just link people.VocalVortex (2 vuotta sitten) #17262346Perhaps we could start personal works/promotion thread for members here for us to share our work. unicornflakes (2 vuotta sitten) #17216109VocalVortex (2 vuotta sitten) #17215797Welcome to the club, I'm glad to hear that you appreciate it! As an UTAU user myself, it's great to hear of other Teto fans that use the software themselves too. I really love your Little Parade cover, it's just so cute and the tuning is amazing ♥ You're always free to share your work here if you'd like to in the future! Thank you so much! You're welcome and your kind words mean a lot to me. A lot of heart♥ and Teto moe went into that cover. I'll keep that offer in mind! Perhaps we could start personal works/promotion thread for members here for us to share our work.